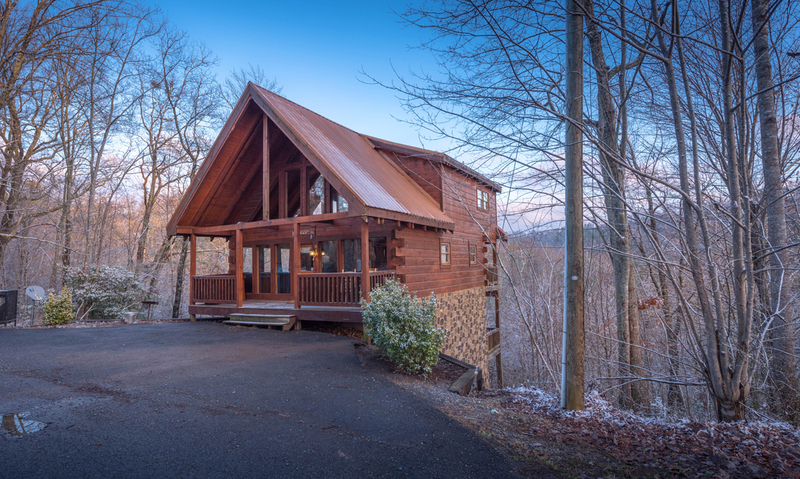 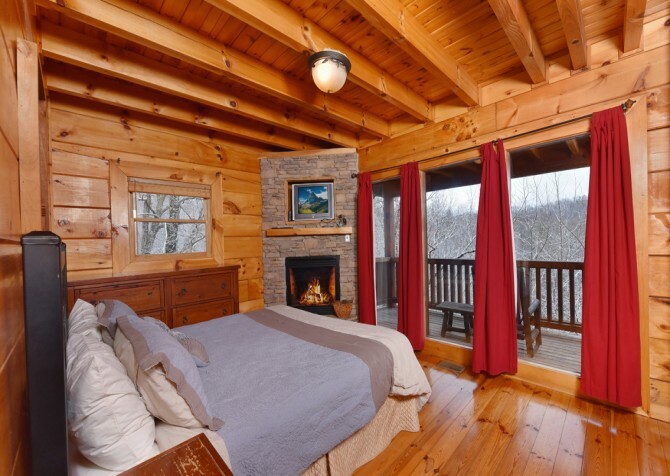 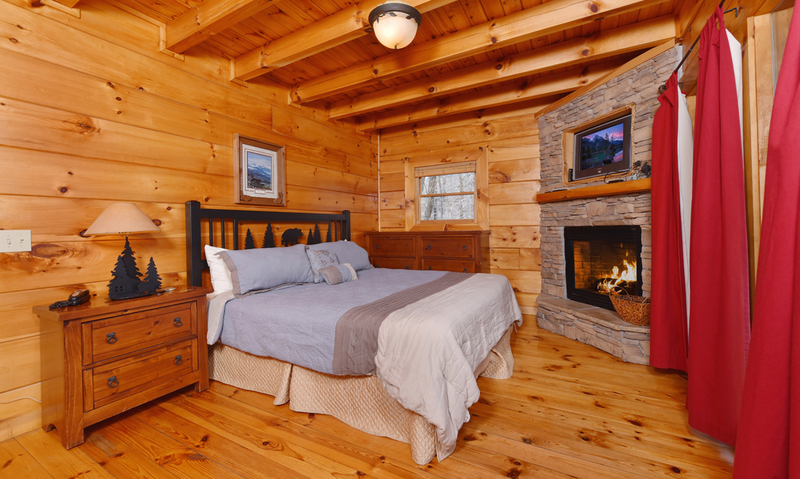 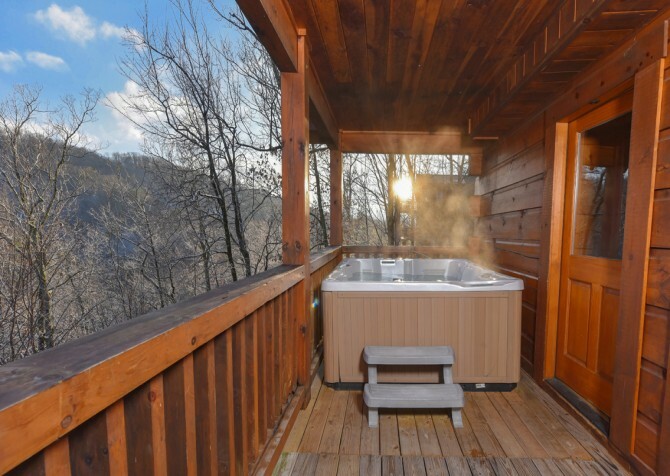 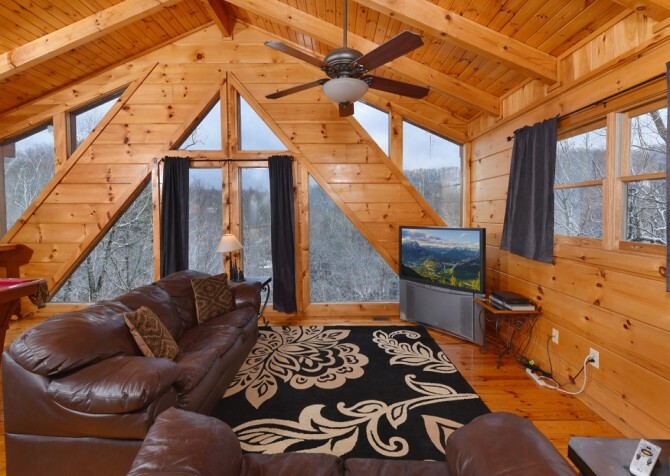 A comfortable, fun, and relaxing cabin in the woods of Gatlinburg, Tennessee, A Bear’s Eye View boasts lots of windows, tree-studded views — plus valley views — and a classic log build that gives you the quintessential mountain experience. From modern fun to homey conveniences, this 3-bedroom, 3 ½-bathroom cabin with space for up to 10 guests really impresses. 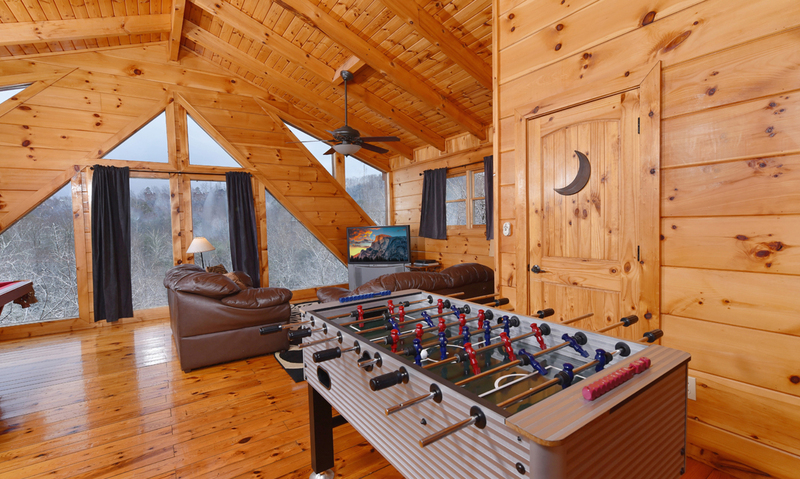 When you’re ready for a break from exploring the Great Smoky Mountains National Parkand downtown Gatlinburg attractions, shops, and restaurants, head back to A Bear’s Eye View for games and inviting spaces. Shoot pool, play air hockey, and try your hand at foosball — all with gorgeous tree-lined views. 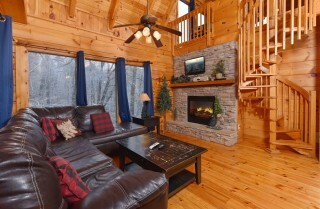 Or you can cozy up in the lounge area upstairs with plump sofas, a big screen TV, and floor-to-ceiling windows. 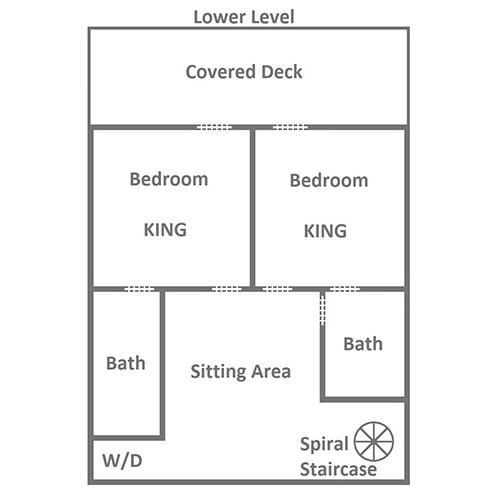 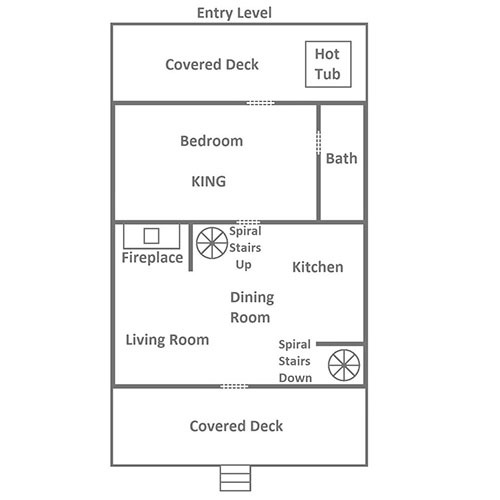 Down the spiral staircase, find the living room with a gas fireplace, more cozy seating, a TV, lots of windows, and the fully equipped kitchen just steps away. It has all you need for in-cabin meals, including a dining table and full-size appliances. 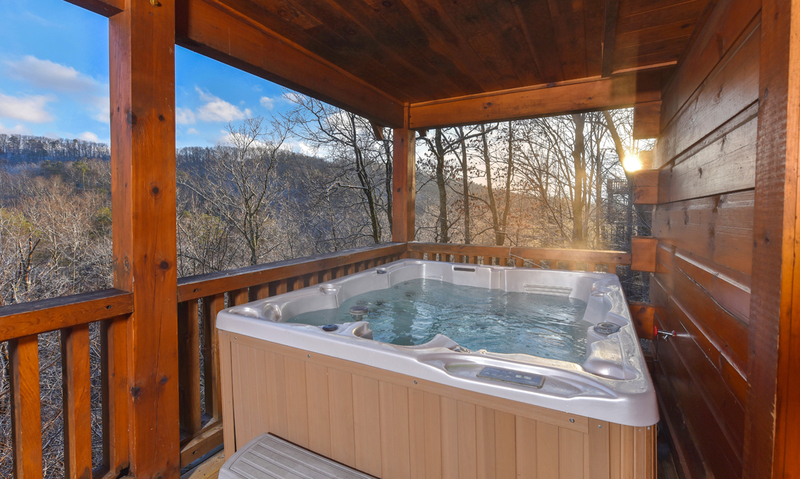 A charcoal grill awaits outside, and the hot tub on the deck is perfect for unwinding after long days. 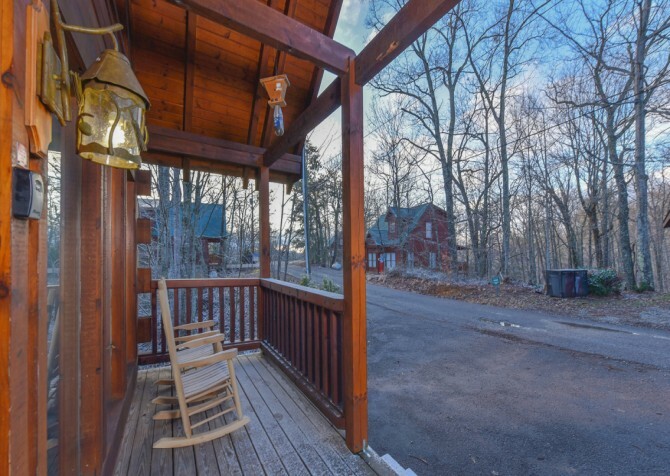 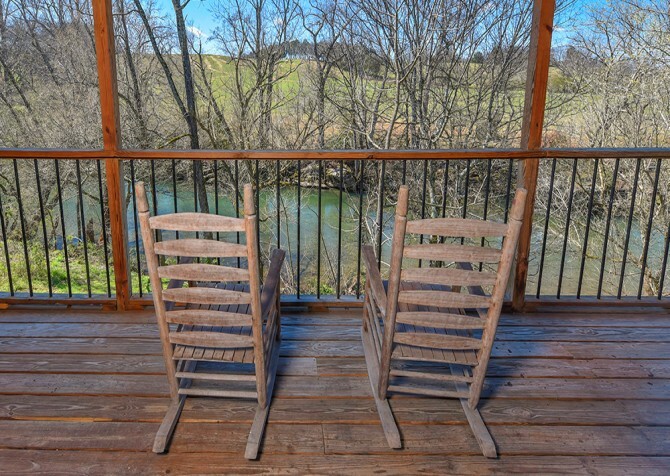 Or just grab a drink and sit back in the rocking chairs to enjoy the views. At night, each bedroom offers its own TV and king-size bed! There are also 2 queen sleeper sofas in the cabin if you need more space. 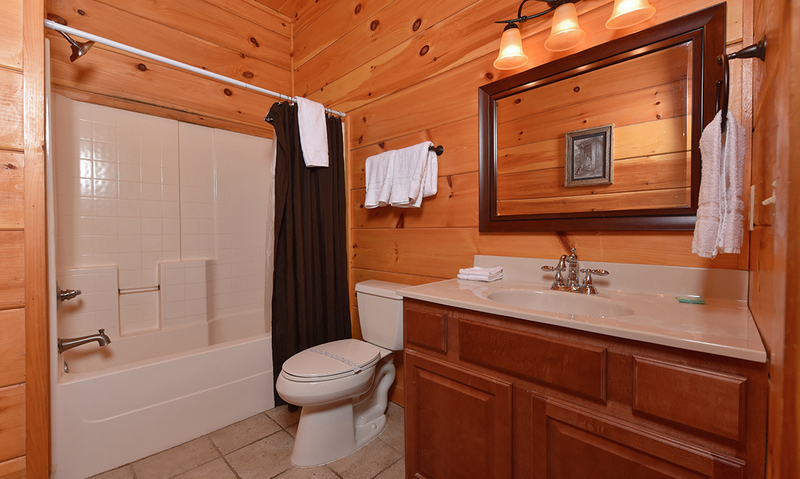 Plus, you’ll have conveniences like wireless internet, an indoor jetted tub, a flat driveway, and a washer and dryer at A Bear’s Eye View! 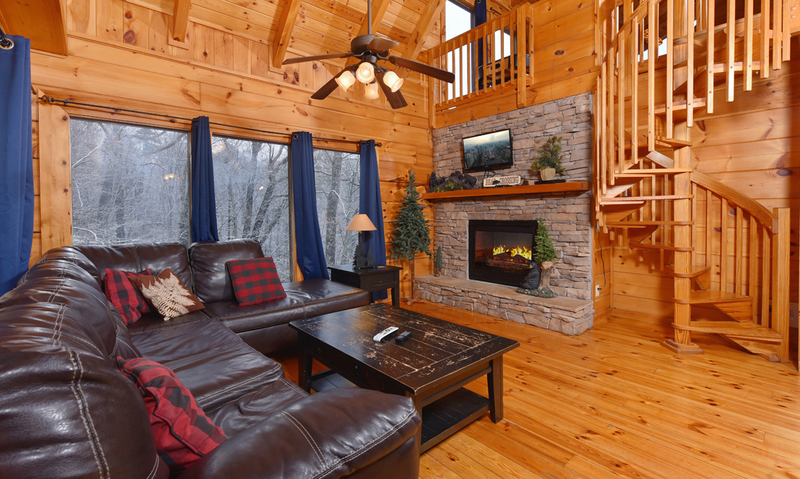 Step into your cozy mountain vacation as you enter the living room, where a plump L-shaped sofa (also a queen sleeper), large coffee table, flatscreen TV, and tall windows await to welcome you. 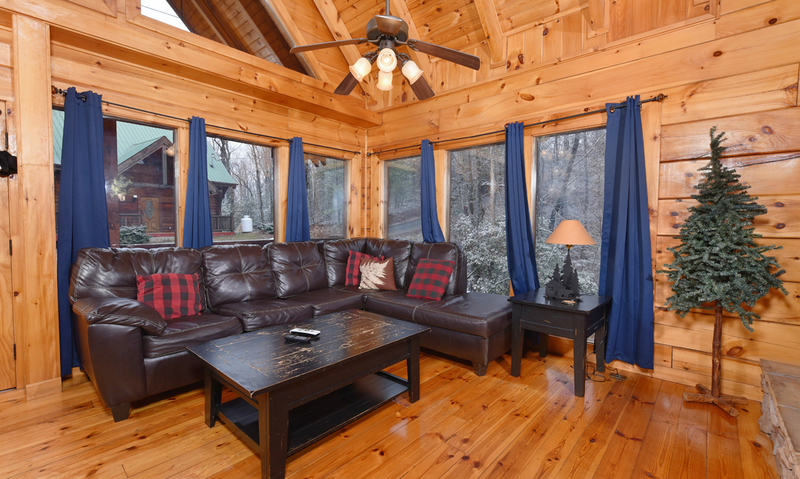 Place drinks and snacks on the table, flip on the TV, and plop on the sofa. Or opt for card and board games brought from home instead! On chilly evenings, the stacked-stone gas fireplace is great for cozying up with your spouse, telling spine-tingling ghost stories to the kids, or curling up for a romantic read. 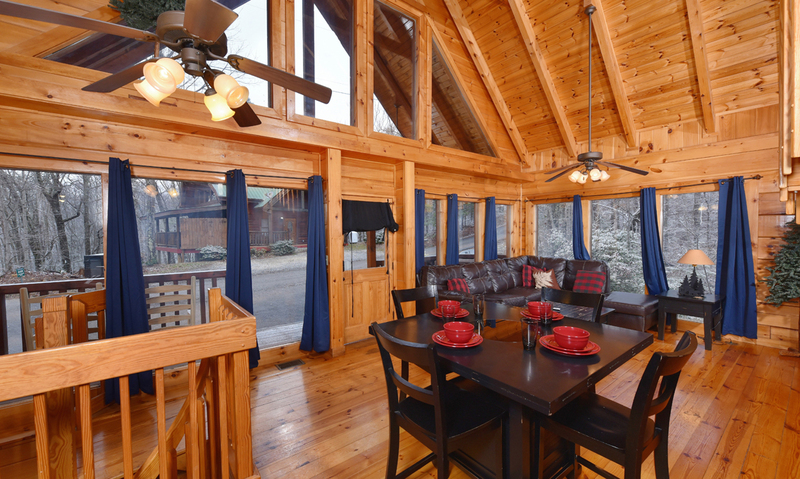 Featuring an open concept, the kitchen at A Bear’s Eye View is convenient to the living and dining areas. 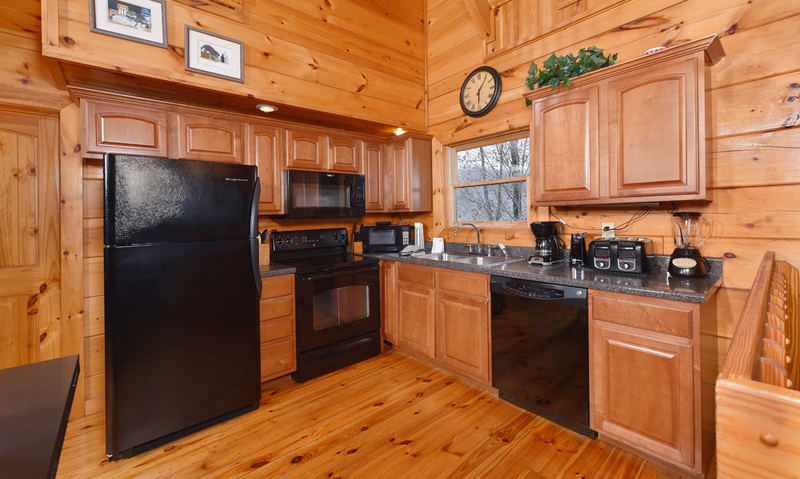 It is also fully equipped with major appliances, cookware, plates, cutlery, glasses, and more to make meal prep easy as pie — which we highly recommend you make! Keep ingredients fresh in the fridge, whip up family feasts on the stove, pop buttery delights in the 2 microwaves, brew a pot of joe anytime, and let the dishwasher clean up the mess. There’s also a blender, toaster, electric can opener, and a stainless-steel double sink. 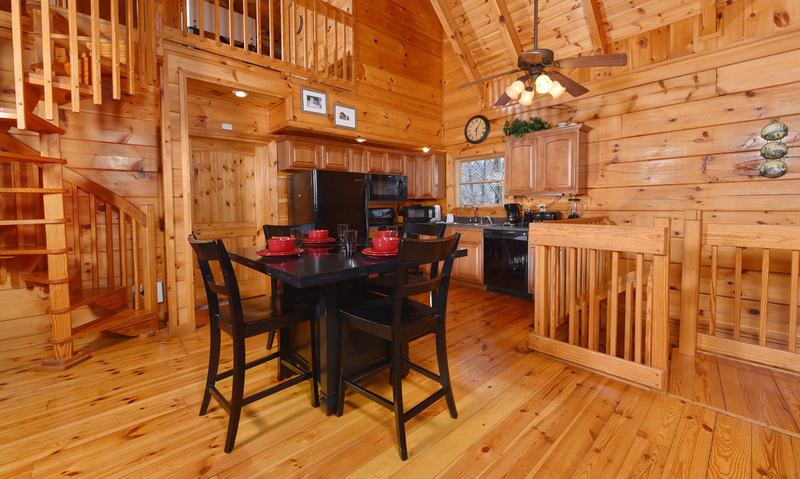 Feet away from the kitchen lives the dining area with a square table for 4, great for mealtimes, coloring time with the kids, wine time with your bestie, work time…nah, don’t worry about that while you’re on vacation! 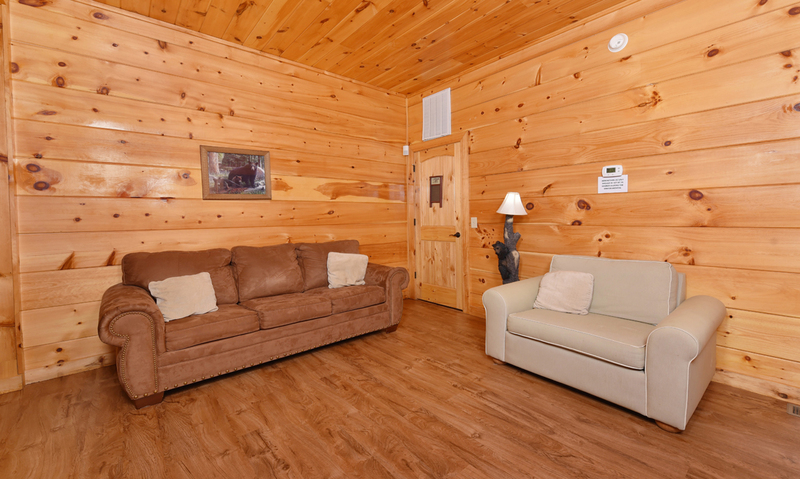 And remember the living area seating is just a few steps away, so the rest of your group will have their own place to dine in comfort. 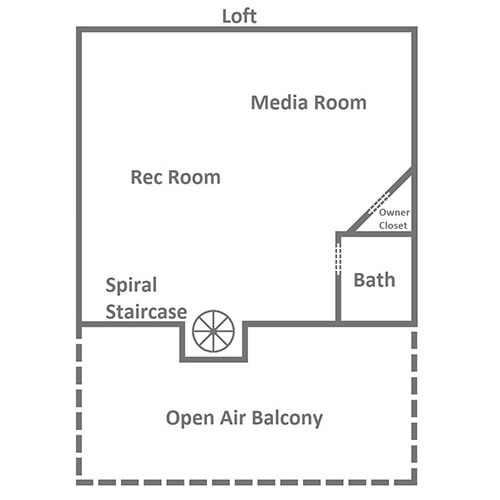 Atop the spiral staircase awaits the rec space, boasting floor-to-ceiling windows with treetop views, 3 game tables, and a media area with a big screen TV, sofa seating (one doubles as a queen sleeper), and a DVD player! 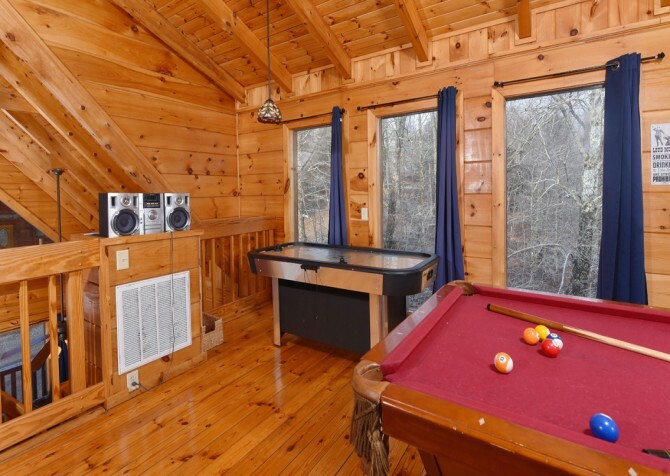 Challenge your pals to air hockey matches, show your spouse who’s boss at pool, and coach your foosball team to victory, all while grooving to your favorite jams on the CD player. 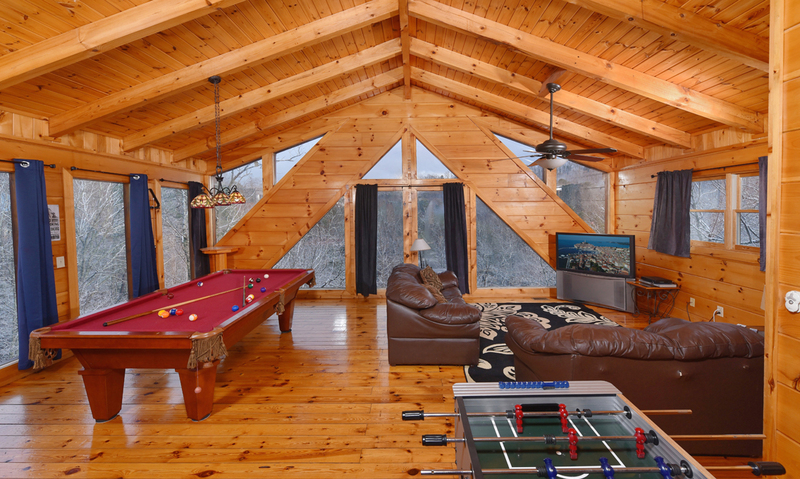 Then, gather the movie lovers in your group for a feature film on the big screen — game tournament champion chooses the DVD! It’s bedtime, and you’re ready to hit the hay on your king-size bed. 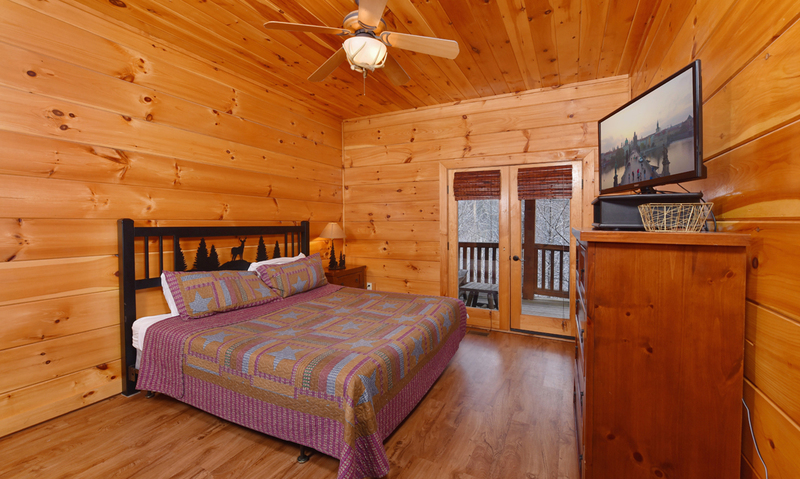 In fact, each bedroom features a king-size bed, a TV, an en-suite bathroom, and direct deck access so you can wake up to fresh mountain air with a steaming cup of coffee every morning! The master bedroom even boasts a romantic fireplace and expansive windows with tree-studded views. 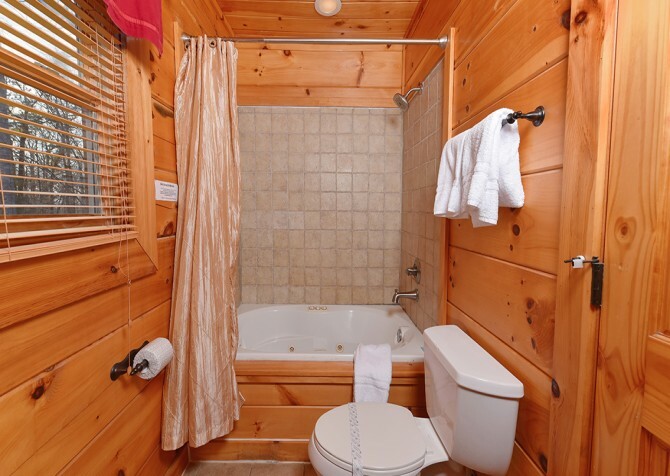 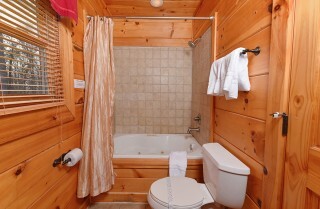 There’s also an indoor jetted tub, great for unwinding after a full day of play at the cabin. 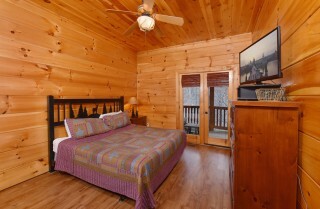 And the queen sleepers in the living room and rec loft are great for extra sleeping space. While the numerous windows will have you feeling as if you’re at one with nature, the outdoor spaces at A Bear’s Eye View will take you that extra step. 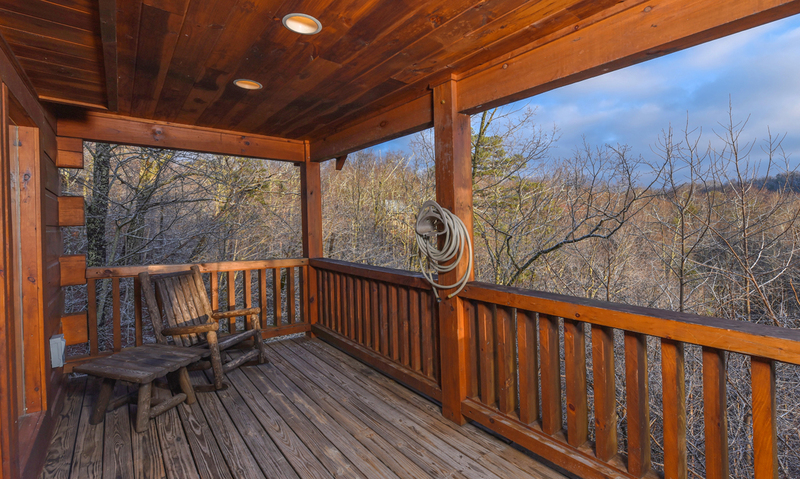 Rock away your worries and cares on the front porch with a glass of wine, head onto the entry-level deck for a soothing hot tub soak with the trees, or sway with a loved one on the second-floor deck’s swing. 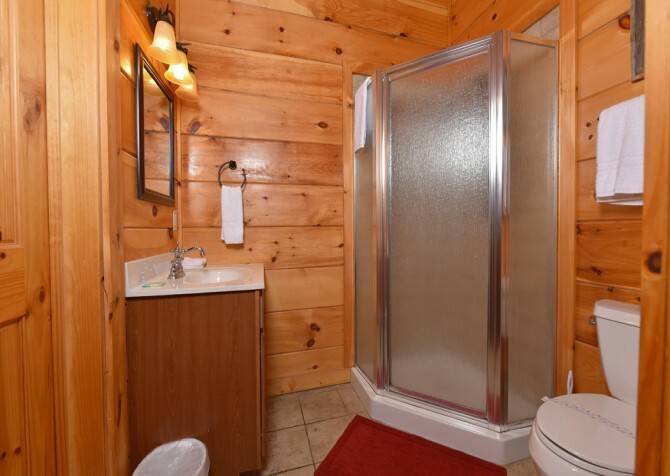 And when you’re ready to head to town for tasty meals, endless shopping, and attraction fun, walk down 3 easy steps onto the flat, paved driveway with parking for 3 vehicles and be on your way in not time. 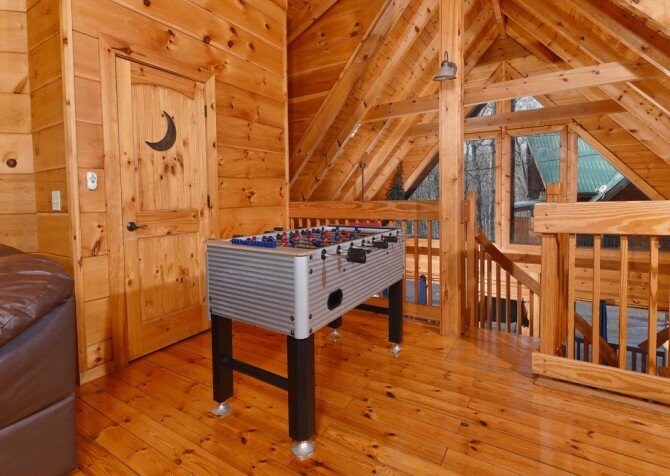 There’s also a charcoal, picnic-style grill, perfect for cabin cookouts. Located in the Sky Harbor community, A Bear’s Eye View offers complimentary wireless internet so you can post trip photos without a struggle and a washer and dryer so you can keep clothes and towels fresh. 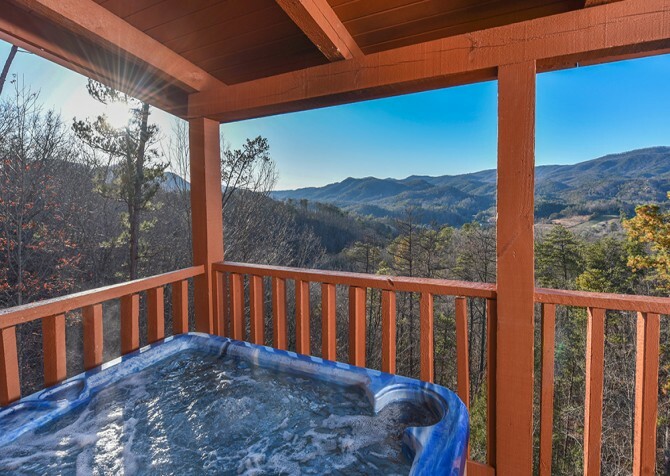 Around 8 miles to the center of Gatlinburg, A Bear’s Eye View keeps you tucked away in the Smokies with a medium drive to in-town fun. 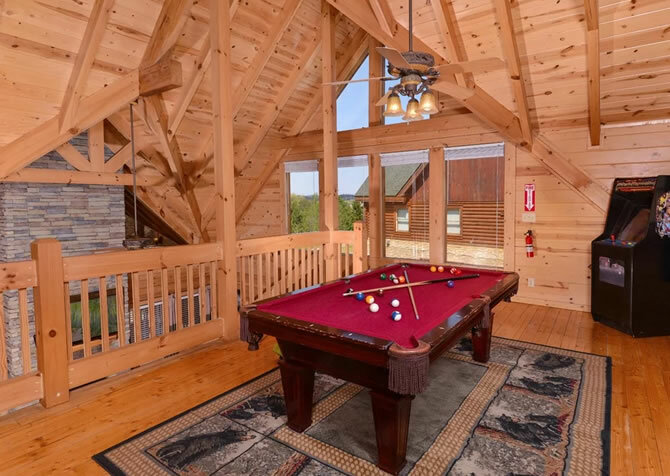 A classic pastime of the Smokies, head to Ripley’s Davy Crockett Mini-Golf for putt-puttin’ fun with family and friends round this old-timey-themed course. Zoom, soar, and whirl around sharp turns as you fly down the mountain aboard the Gatlinburg Mountain Coaster, one of many fun mountain coasters in the area. 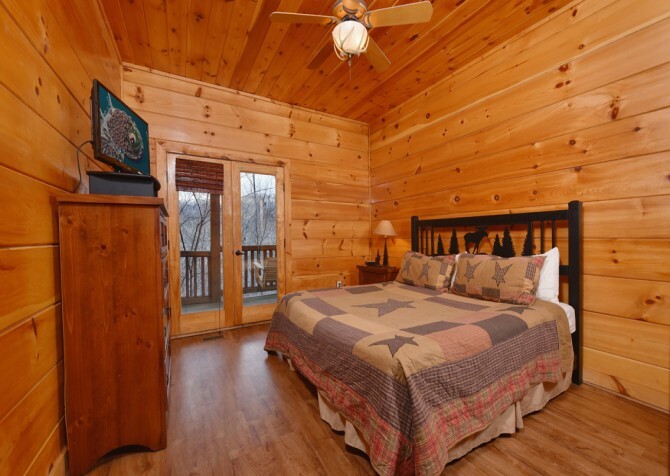 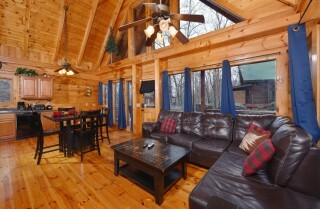 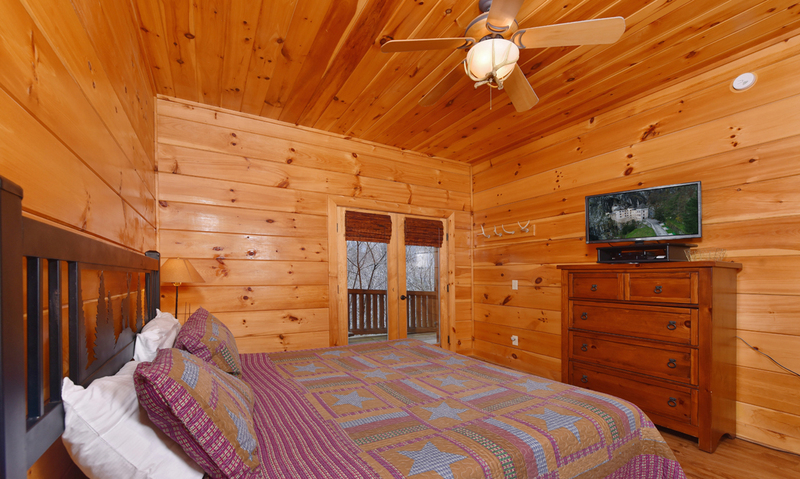 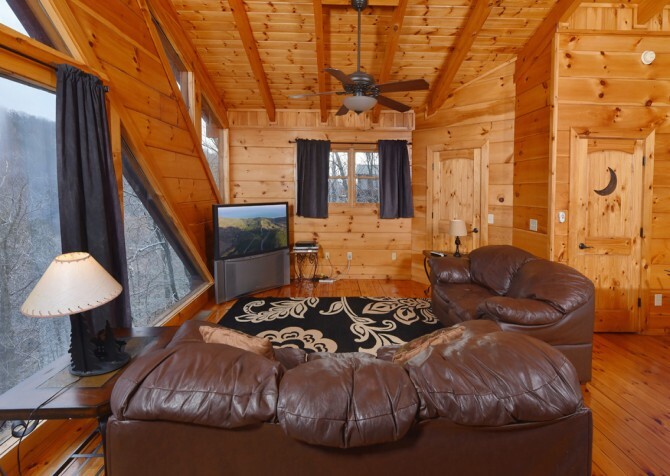 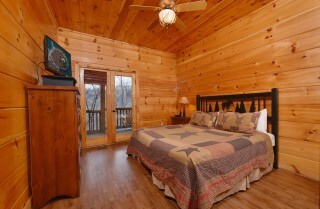 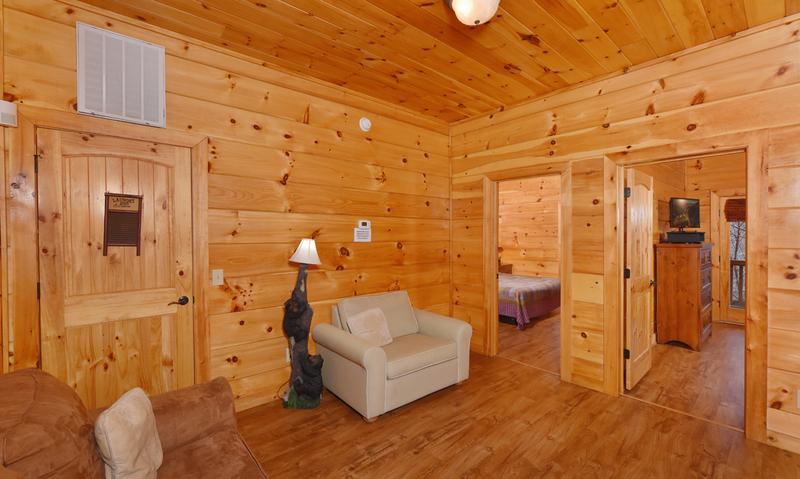 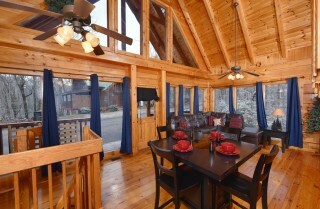 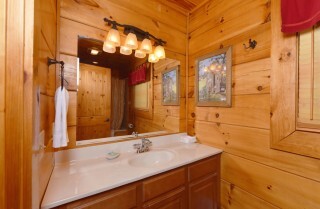 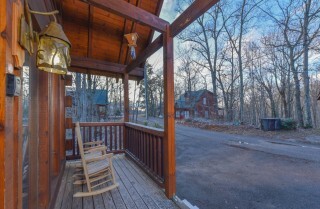 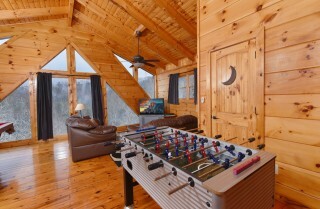 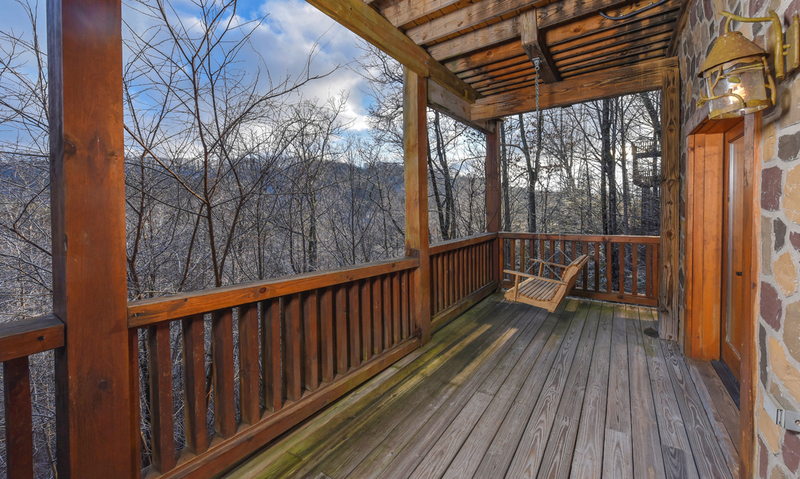 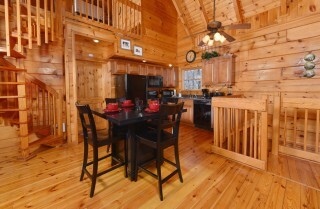 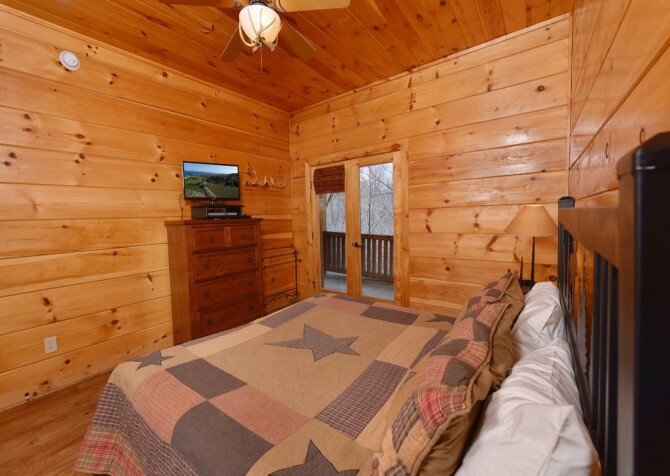 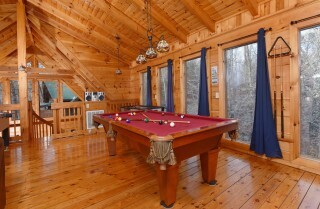 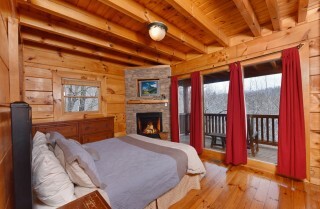 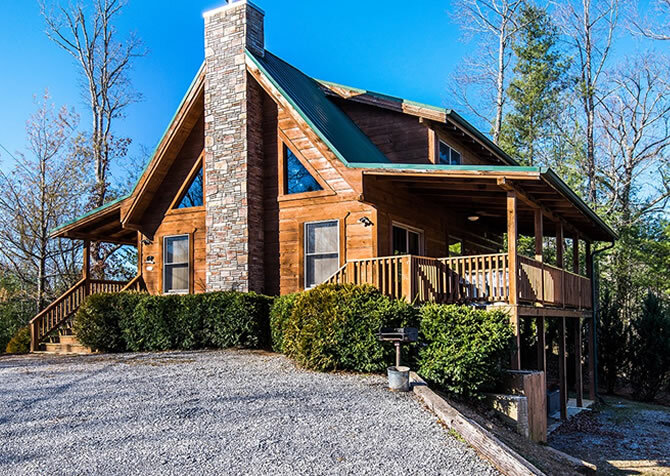 "Great cabin and just about 10 minutes from Gatlinburg. 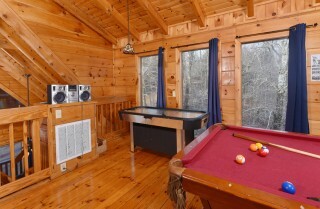 Cabin very clean and so updated. I will definitely book again on our next visit to Gatlinburg"
Thank you so much for your review! We can not wait to have you stay with us again on your next stay in the Great Smoky Mountains!